Well hello there, it's been some time since I've put finger to laptop (doesn't quite have the same ring to it as pen to paper does it?!) well without going into detail something extremely major happened and I needed to take myself away from things, including my blog, but I'm starting to feel brighter so I'm back! Not only am I back with a review, I'm back with a giveaway, kind of a little sorry I've been gone but I'm back now so don't hate on me for disappearing giveaway! Yves Rocher Makeup was totally new to me until I was sent a few products to review. I've tried some of their skin care, which I do like, but had never dabbled in their makeup range. I think what sets Yves Rocher apart from a lot of other cosmetic brands is the fact they not only use natural ingredients within their products, they actually grow their own plants within their botanical garden to use within all of their products, for me this is a welcomed presence within the beauty industry. 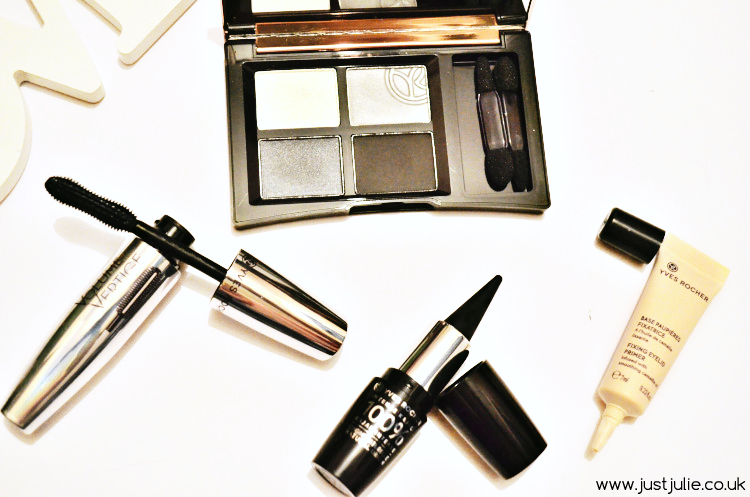 The products I was sent was all to aimed towards helping someone achieve a smokey eye, and for those who know me well, will know a smokey eye is my go to look! For me I can't wear eyeshadow without a primer underneath so the Yves Rocher Fixing Eyelid Primer* is the first product I used. This did a pretty good job at evening out the redness on my eyelids as well as providing a smooth base for eyeshadow. I'd say this is very similar to the Urban Decay Primer Potion, texture wise as well as durability, as my eyeshadow stayed put all day long and didn't crease. So big thumbs up from me. 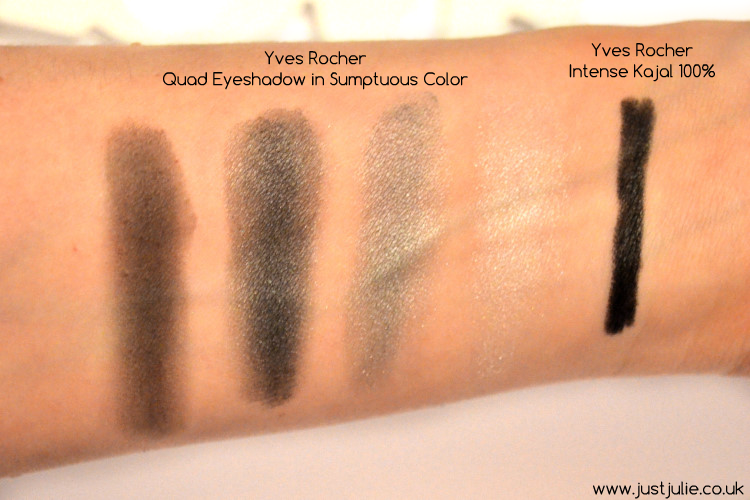 Next up is the Yves Rocher Quad Eyeshadow in Sumptuous Color* I chose this shade because I don't already own plenty of greys/silvers and blacks... yeah that's a joke! I'll never get bored of trying out new smokey palettes! This consists of the usual suspects found in this kind of palette, there's a white, silver, grey and matte black. Pigmentation wise they are all good and they blend in easily and coupled with the Fixing Eyelid Primer they didn't crease at all. What I like about this palette is that it's not too dark, which would make it ideal for those who are new to the smokey eye look, but if you really want to create something dramatic, you can just apply more of the black and bang, full on sultriness! I've never tried a Kajal pencil before so this is the one product that intrigued me the most! Yves Rocher Intense Kajal 100%* I'm going to be honest, I tend to prefer a finer line when it comes down to liners, so this really isn't for me BUT I will say it does go on really smoothly and when you smudge the line out it does create a stunning smokey eye look on it's own. Finally we have the Yves Rocher Mascara Volume Vertige* This reminds me of L'Oreal Million mascaras. It has a similar shaped plastic wand, however this one is slightly hourglass shaped which means it really gets up in to every lash to create some good length and definition. Volume wise, it's ok. You can build it up and it doesn't clump together, however the volume is not too intense. I think this would be great for those who like to add a hint of volume but love to define their lashes at the same time. Overall I'm really impressed with Yves Rocher Makeup and my first impressions of the brand is great and I'm keen to try out some products from the brand! Moving on.... as I said at the start, I have a giveaway and one person can win every single product above courtesy of Yves Rocher Makeup. The giveaway will run for two weeks and is a UK only giveaway (sorry international folk) There is only one mandatory option but there's additional options to enter if you want to have more entries to win! Full terms and conditions are included within the Rafflecopter widget so please have a read of them.